How to manage your site navigation. The main site navigation bar in the header displays the first level links with dropdowns to display the second level links once a top level link is selected. Additionally, the navigation bar includes a search box. Your footer will show the navigation also. NOTE: Only first level navigation items will be available in the footer navigation. You can add, delete and edit links in your navigation module. 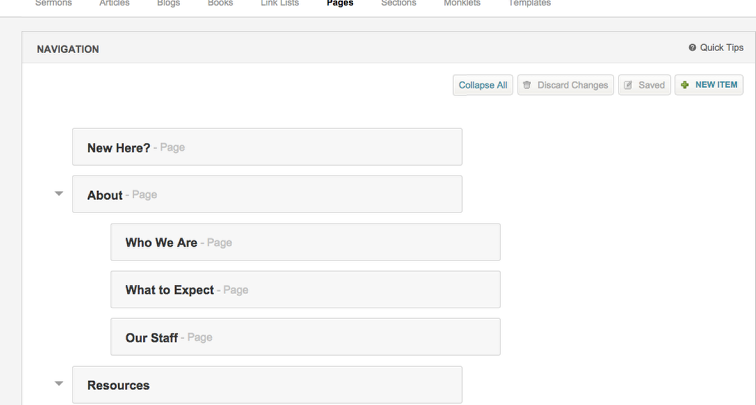 To access your navigation structure select Content > Pages > Navigation. From the navigation module you can manage your main navigation related to your main and secondary site navigation items. NOTE: Creating a navigation item does not create a new page automatically for you. Your navigation is used to link visitors to an already existing piece of content on your website or external to your website. Hover over an individual navigation item to see your navigation tools. + The plus or ADD symbol will open a new navigation item window. The new navigation item will show up under the current navigation selection. Pencil The PENCIL symbol will open the editor for the current navigation selection. Use this tool to update or change an already existing link. The Editor has a few inputs that make creating a navigation link a breeze. PARENT: If you choose a parent for your link then the link will be nested under the parent. In this example below our link will show up under the Contact Us navigation item as a child. OPEN IN NEW WINDOW: Select this input to have your link open in a new browser window or tab depending on your visitor's settings.